TRI-CITY NEWS – Coquitlam’s Chanell Botsis really knows how to throw her weight around. 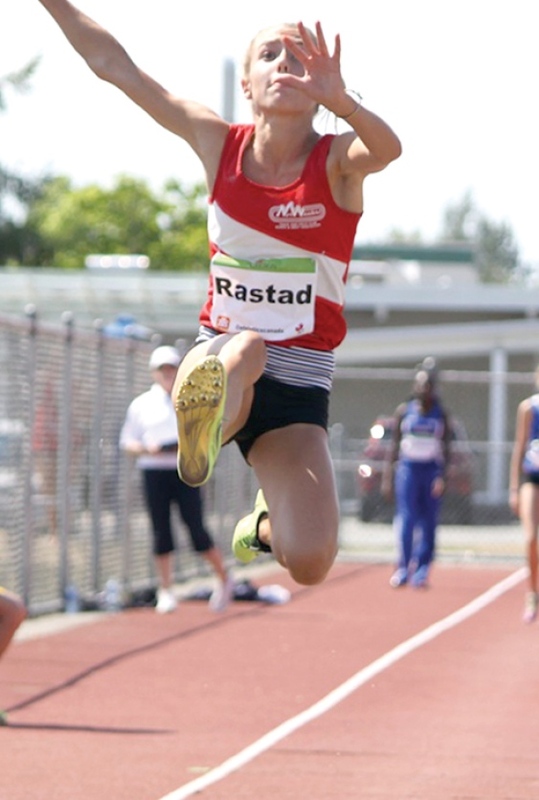 The 15-year-old won a gold and silver medal at last weekend’s 2013 Legion Canadian youth track and field championships at Langley’s McLeod Park. Botsis broke her own national record in the hammer throw to win gold in the U-16 girls category with a toss of 55.21 metres. She also picked up a silver medal in the U-16 discus with her throw of 36.40 m.
“I was happy with both my performances but I was hoping for something further in the hammer throw. In the discus throw I achieved a personal best of 36.40 but in the hammer throw I was three metres short of what I wanted to throw,” said the 2012 entrant into Coquitlam’s Junior Girl Sports Hall of Fame. Botsis has been throwing the discus and javelin for the past four years — with a back injury forcing her to give up the javelin this season — and only picked up the hammer two-and-a-half years ago. “The first day I joined track and field I walked on the track and saw other people throwing. I was so interested and excited to try it. I didn’t know what the hammer or the javelin was until I was able to see other athletes practising,” she said. Botsis began her track and field career with the Coquitlam Cheetahs before moving on to the Richmond Kajaks to get specialized training with her throwing events. Botsis now has her sights set on the Youth Olympic Games in Nanjing, China next summer. “I will focus on training with hammer as I feel it is my strongest event and I am currently ranked No. 1 in Canada and have a good chance to qualify to make the standard and the team,” she said. She hopes to represent Canada at many international competitions in the future and eventually land a scholarship to a U.S. university. Port Coquitlam’s Brittni Wolczyk also struck gold at the Legion Nationals in the U-18 women javelin with a throw of 48.71 m.
Coquitlam’s Jasmine Lew brought home a pair of silver medals despite competing against girls two years older than her. The 13-year-old was part of the second-place 4×100 m relay team and also won silver in the 1600 m medley. Lew also posted a 10th place finish in the U-16 100 m and finished 11th in the U-16 200 m.
Anastasia Evans with the Coquitlam Cheetahs earned bronze in the U-18 women’s high jump, clearing 1.60 m.
Isaac Evans cleared 1.70 m to snare sixth spot in the U-16 boys high jump, while Adeyemi Taylor-Lewis finished sixth in the U-18 men’s 200 m in a time of 22.51 seconds. Canada’s top teenaged track and field athletes were going for the gold medal over the weekend at Langley’s McLeod Athletic Park as the 2013 Canadian Legion track and field championships were held. The event, which featured close to 1,000 athletes between the ages of 12 and 17, will also be held at McLeod Athletic Park in 2014.